Wickneswary’s husband left her and her infant son to find work out of the country – she never heard from him again. 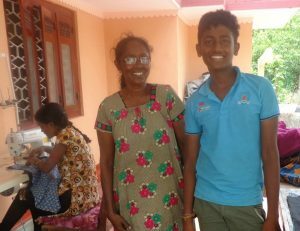 A series of HEED micro-loans have enabled her to build her tailoring business, educate her son, and create jobs for others. You can support YGro-HEED as they extend the kingdom of heaven to primarily women providing for their households in post-conflict Sri Lanka. HEED offers affordable access to micro-loans and basic business training to approximately 2,000 clients. The 2018 Sri Lanka Fund would like to make a grant of at least $20,000 to YGro-HEED to build their capacity to empower more micro-entrepreneurs. 100% of your donation will go to YGro-HEED.